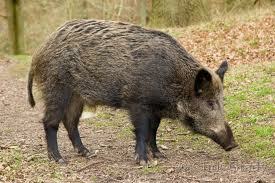 Reality and Fiction: Don't kill Haifa's wild boars! Don't kill Haifa's wild boars! For the past few years I have enjoyed watching from my balcony the wild boars who visit our garden at night during the spring and summer. I consider it a privilege to be able to watch them from my home. These animals have no natural predators, and have traditionally not been hunted for food in this area, since the local Jewish and Moslem population consider pork to be unclean for eating. The boars' natural habitat is the mixed woodland of Haifa's forests, hills, and valleys. As humans have encroached on their living areas, they have, in turn, ventured into residential areas where they can forage for food. Now it is reported that the Haifa municipality is allowing the hunting of wild boars in residential areas in an attempt to cull them. Some residents dislike the boars because they dig up people's gardens. Others are just afraid of meeting large animals in the dark. There has also been an argument that boars could cause traffic accidents. So far I have only heard about accidents with boars on dark intercity roads, and I don't think there have been any within the city, where streets are better lit and cars drive more slowly. I strongly object to shooting the wild boars in the city. The boars lived in this area before humans did, and we have to coexist with them. They don't cause enough damage or pose enough of a risk to humans to justify murder. At this time of year the young are still nursing and dependent on their mothers, so killing the mothers would sentence the young to starvation. I also believe hunting with guns should not take place within residential areas due to the risk of shooting humans or pets or damaging property. I would love to sign but it is in Hebrew!AriadnefromGreece! In the petition, the first required field is full name and the second required field is city.